I continued my quest of cleaning up the kitchen pantry this week and found these two ingredients that have been awaiting my attention – Quick oats and hazelnuts. I remember buying quick oats to make energy bars but never got around to doing that and the hazelnuts were bought with the intention of turning them into Hazelnut butter but by the time I was ready to make the second batch of Hazelnut butter, my daughter had moved on to Peanut butter. So here I was wondering what I could do with both these ingredients and I vaguely recollected reading a recipe for Almond Butter-Quinoa Blondies using Quinoa flour. 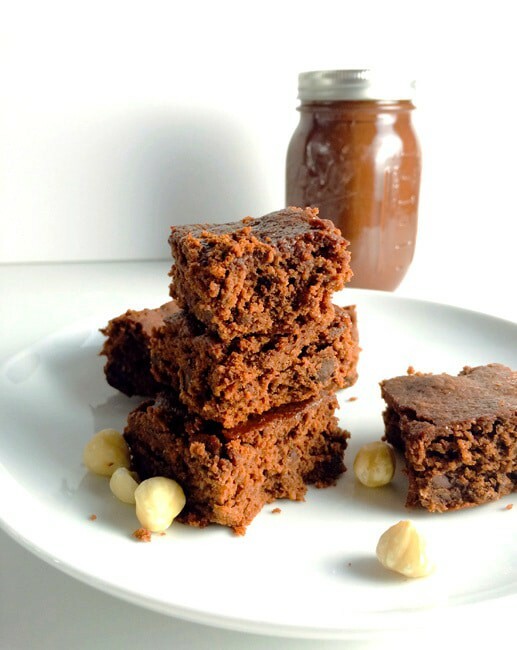 That was it, I decided to replace the Quinoa flour with Oat flour and almond butter with hazelnut butter and make some brownies. Sounds like a disaster of a recipe, right? At least it did to me. But I was wrong, so wrong! 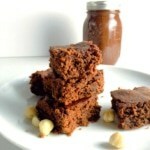 The Oats -Hazelnut butter brownies turned out to be AMAZING! It was so soft and spongy and my daughters LOVED it. Pardon my caps but I am still blown over on how wonderful they turned out to be. Go ahead and try it out and let me know how they were. Preheat oven to 350°F. Line an 8 inch square baking pan with parchment paper and allow it to slightly overhang at the opposite ends. Coat the paper with cooking spray. In a mixer fitted with a paddle attachment, beat yogurt,oil and hazelnut butter until creamy. Add in eggs and brown sugar and beat them until combined. Combine oat flour, baking powder and salt in a separate bowl. Add the flour mixture into the wet ingredients and mix them until just combined. Add the chocolate chips and gently stir them in. Pour and spread the batter evenly into the prepared pan and bake for 25 minutes. Check to see if the brownies are done using the toothpick method: a toothpick inserted into the center of the pan should come out clean. Remove to a rack to cool for around 30-45 minutes and cut them into squares. Let cool completely before storing them in the refrigerator. Consume within 3-4 days.